D.J. 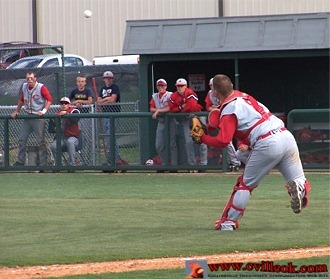 Neighbors cleared the fence for a solo homer in the third inning of the 11-3 CHS Baseball Cardinal 4A Regional win over Glenpool Thursday (May 1st). Kevin Phillips had homered in the first. 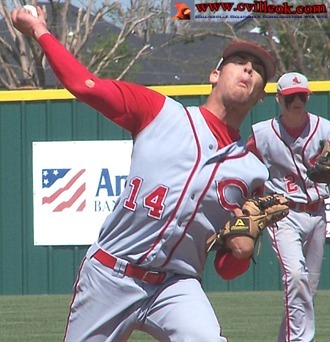 Friday May 2nd: Harrison Mendez pitching against Hilldale. This was Kevin Phillips' 2nd homer against Hilldale Friday. The first was a solo homer in the 3rd. 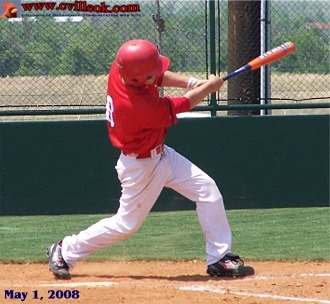 The photo above was the swing that broke a 5-5 tie in the 6th with a 3-run homer. 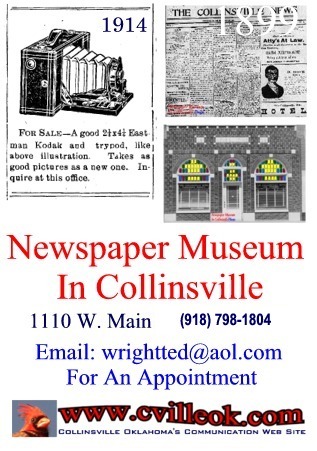 Collinsville won 8-5. WIDE TURN? 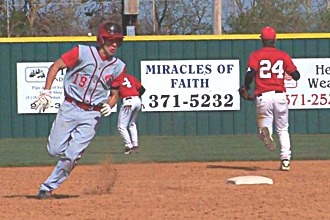 -- This play in the 5th inning Saturday against Fort Gibson was a huge momentum shift in the 4A Regional final. Kevin Phillips/Garrett Tole had gotten the lead runner at 3rd on the previous play and would have had a 2nd out at 3rd on this play. 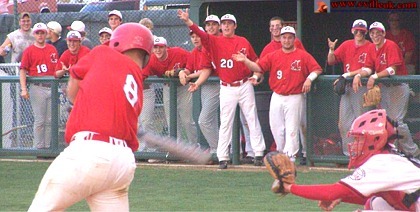 The base runner had been caught between 2nd & 3rd but avoided the Garrett Tole tag (above) by running around the tag. 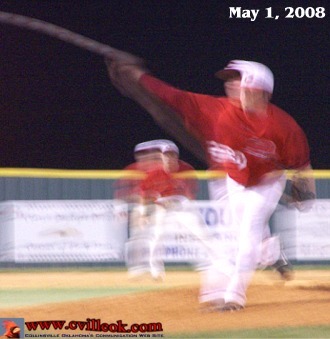 Brock Werdel appears as a pitching blur in the second Cardinal Regional game here Thursday. 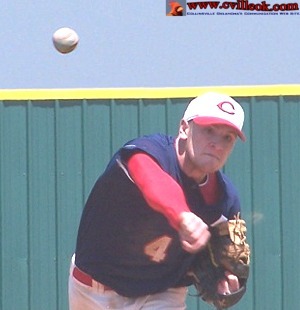 Brock pitched into the 7th inning against Fort Gibson with a one run lead but Collinsville lost 6-10. 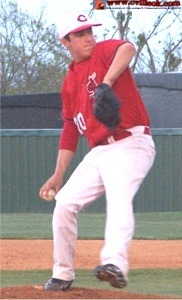 Randy Rogers pitching against Glenpool. D.J. Neighbors pitching against Glenpool. CHS students got out a bit early Thursday to see a portion of the Cardinal's win over Glenpool. All of the games were well attended. Lane Coulter batting against Glenpool. The Cardinal dugout stayed involved in the games. 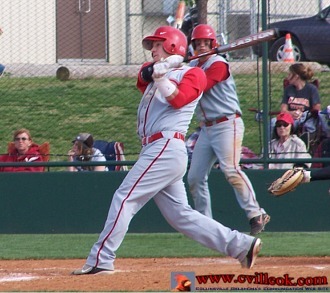 Bobby Shoate batting against Fort Gibson May 1st. 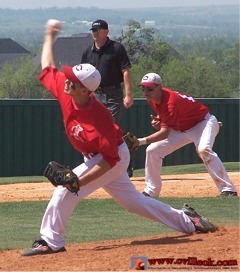 Brock Werdel pitching against Fort Gibson May 1st. The sky was threatening west of Collinsville (with tornados and lightning that continued through several states) but 3 games were completed here Thursday May 1st before a heavy overnight rain. 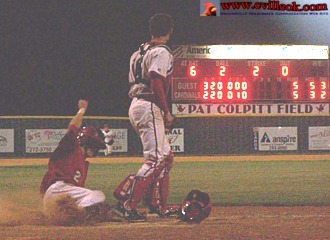 Brad George scored the go-ahead run in the first Fort Gibson game putting Collinsville up 6-5 in the 6th inning. 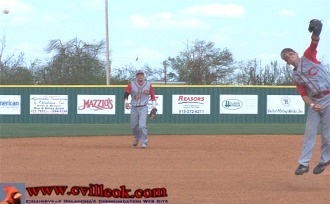 Collinsville had the bases loaded with no out after that but had 2 runners picked off preventing further runs. Fort Gibson added 5 runs in the 7th. 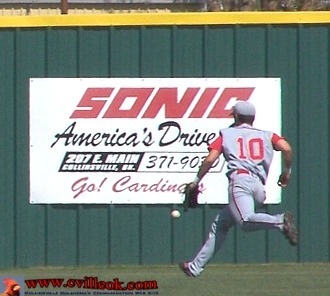 Lane Coulter tracks down a Hilldale hit to the right field wall May 2nd. Riley Murr is on his way to 3rd as the throw heads back to the infield for a 2-out triple in the 6th inning against Hilldale. This was followed by a Brad George walk and a Kevin Phillips home run to break a 5-5 tie. Bobby Shoate throws to Kyle Keith at 1st base accounted for all 3 Hilldale outs in the 7th inning. 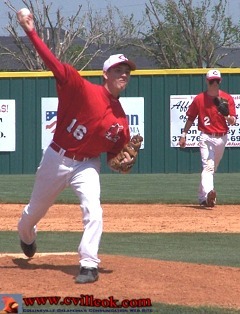 Kevin Phillips pitching against Fort Gibson May 3rd. 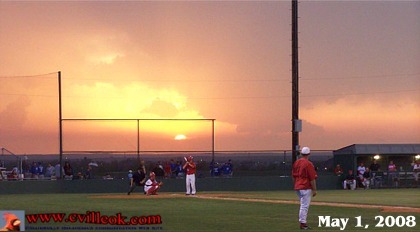 CHS baseball team beat Glenpool 11-3 in first Regional game here Thursday. -- Ted 3:45pm May 1st.